Fungal infections of the cornea – fungal keratitis – are the most common cause of blindness among horses in the southeastern United States. The condition is widespread in horses from all US states east of the Rocky Mountains. Similar to human keratitis, the most common causes in horses are the Aspergillus and Fusarium fungi. It is challenging to manage and can lead to blindness or even removal of the affected eye. Fungal keratitis in horses share similarities to human cases – raised corneal ulcers with a feathery border, satellite lesions, and more widespread inflammation inside the eye. Once fungal keratitis develops, treatment is the same for all cases, regardless of fungal species. However, more than 50% of horses with the problem do not respond to medical therapy and either require surgical repair or eye removal. Researchers have now used molecular analysis to learn more about the fungi that attack equine corneas, their susceptibility and response to antifungal drugs, the path of the disease, and outcomes. 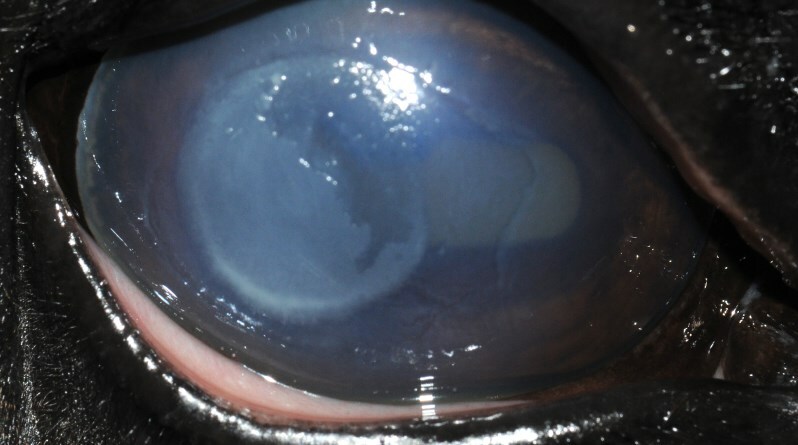 The study team from North Carolina State University used 32 horses with fungal keratitis whose owners sought treatment through the university’s ophthalmology service, or through Auburn University in Alabama. Samples were collected from infected eyes before antifungal therapy was employed. They were cultured before undergoing DNA analysis. Megan Cullen and her colleagues, reporting in the open-access journal PLOS ONE, found that two species of Aspergillus (A. flavus and A. fumigatus) and three species of Fusarium (F. falciforme, F. keratoplasticum, and F. proliferatum) were the most common fungi isolated and identified. In 91% of the Fusarium cases, the fungi were part of the solani species complex with nine genetically diverse strains/lineages; while 83% of Aspergillus behind the disease were nested within the A. flavus clade with three genetically diverse lineages. The fungal species and their evolutionary lineage were not associated with clinical outcome, they found. However, the Fusarium species that caused fungal keratitis in the horses were more likely to be associated with stromal keratitis. Species of Aspergillus were found to be more susceptible to voriconazole and terbinafine than species of Fusarium, while species of Fusarium were more susceptible to thiabendazole than species of Aspergillus. At the species level, A. fumigatus and A. flavus were more susceptible to voriconazole and terbinafine than F. falciforme. Natamycin susceptibility was higher for F. falciforme and A. fumigatus compared to A. flavus. Furthermore, F. falciforme was more susceptible to thiabendazole than A. flavus and A. fumigatus. “These observed associations of antifungal sensitivity to natamycin, terbinafine, and thiabendazole demonstrate the importance of fungal identification to the species rather than genus level,” they said. Traditionally, the fungi behind such infections have been identified through smears and cultures. Cultures reliably differentiate Aspergillus, Candida, and Fusarium, but do not generally allow identification at the species or genotype (lineage) level for identifying pathogenic forms known to infect the cornea. Fusarium, for example, comprise at least 18 distinct species, which may exhibit differences in disease aggressiveness and susceptibility to antifungal medications, which if identified, could dramatically improve management of such infections. More accurate identification of the fungal species and lineages is critical for diagnosis and therapy, the researchers said, particularly when correlated with disease outcome and prognosis. “The results of this study suggest that treatment of equine fungal keratitis with antifungal agents requires accurate fungal species identification,” they concluded. The antifungal agent used should be tailored to the infecting fungi, meaning accurate fungal species identification is critical to effective treatment.